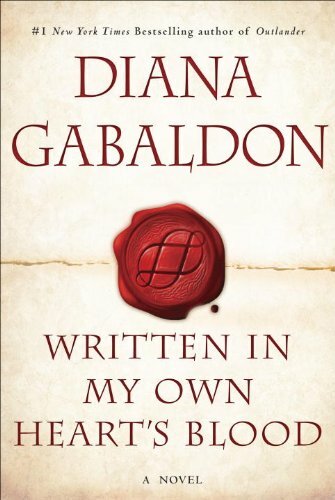 Outlandish Observations: What do you do when a new Gabaldon book comes out? I read quickly the first time, to find out what happens, then do a slower re-read to catch all the details. This will be the first time I read a new release from DG. I will NOT look at the ending because that is an old habit I'm trying to break. I will NOT read the bottom of a page to see what happens before I read the top. I'm learning to savor every word as I let the story unfold at my own brain's pace. I find that my excitement builds when I follow Diana's flow of narrative and I'm never disappointed. I read so quickly the first time I barely remember what I've read. Then I go back and read again to pick up all that I missed. Then a month or so later I read to savor. And then I put it in the queue to read in all my rereads. This will be the 1st time I've waited for a new DB book specifically. I have all the rest of her books on Kindle, so I'll probably get MOBY that way too. I usually try to wait for a sale though, so I fear I may have to unfollow everyone on twitter to avoid spoilers, which is terrible because of all the excitement for the TV show! Waaaah! I dedicate my day(s) as much as possible to reading the book, and do my best not to rush through (and not look at the ending unless unbearable tension makes me do it!). I prefer to read the hardcover the first time and have the ebook for portable re-reads. I will admit to being somewhat obsessive about details, so I take notes while reading in order keep events straight in my mind, or to find favorite lines or passages later. The total outline I have for the current seven books runs twenty-one pages. Well, I'll be getting mine from the library, which means a fast read (I have a feeling there'll be a huge hold list, so no renewing!). But then I'll get it again and reread a few times. I'll buy it in paperback and let what I may have missed soak in. Read, re-read, check other books for clues and storylines, hopscotch around to various parts, go back and read start to finish slowly. And listen to the Audible version for what I may have missed the first 3 reads. Then get online and see what others are saying; realize I missed something and go back and read that part again. I try not to read the last few pages, but sometimes I do, just so I can the book down and go to sleep! I haven't read the early, teaser chapters Herself has out there- I made the mistake of reading the excerpt at the end of "Echo," and it's been driving me crazy since. I can't imagine even going near the end pages first, either- why ruin the ending? Enjoy the journey! I'm just hoping to finish reading it in order to have enough time to re-read Outlander before the show premieres! Susan - I don't understand why some people read the ending first. Diana Gabaldon refers to these readers as "Peekers", and it's not meant as a compliment!